Exiting Zambia was very swift, exit stamps and carnet completed in 5 minutes, even though the border staff were very laid back. The crossing between Chipata and Lilongwe is confusing, for once on the Malawian side there are no directions or suggestion as to where to go. We started driving down the road, and after 10 km we hit a police road block - oops, had we missed the immigration and customs and were we now illegal aliens? The first question the police asked us was 'what have you brought me?' Not even a 'hello', or 'hi nice to meet you?' It was not a problem and Adrian told him that we bought greetings and friendship from the UK. That fooled him (unsurprisingly!) and in response to our question about the location of the border he reassured us that the border post was a further 10-15 km on. At Malawi immigration we were greeted by a very dour lady with possibly the most vicious stamp we had yet come accross - we were fearful that every page in the passports would have the imprint of Malawi embossed! We had no Malawi Kwacha, having ignored the numerous money changing touts on both sides of the border, but customs immediately demanded KW200 to process the carnet (which included the production of a receipt!). In addition we had to pay US$20 for road tax and they stated that our newly acquired 3rd Party Comesa Insurance (with specific cover for Malawi) was invalid. According to the officials, 3 of whom became involved in our 'discussion', because South Africa had withdrawn from the Comesa scheme and our vehicle was registered in South Africa, our cover was invalid. We had not heard such nonsense for quite some time and ignored their advice that the police road blocks would fine us. Crossing the Malawian border was a pain, but we suspected it would only get worse and smiled our way through. Thankfully the Africans have not yet caught up with scarcasm, which was our chosen release! (NB: we were neither stopped nor asked for any proof of insurance documentation whilst in Malawi!!). What is good about Malawi were the roads - smooth new tar all the way! We could not believe it and kept the speed down fearing a pothole any second! What was immediately noticeable is the constant stream of people walking along each side of the road. In fact, it is nearly impossible to find a place to stop for a quiet drink/picnic lunch due to the constant presence of villages and people. We ate one lunch at what we thought was a quiet spot, only to be watched by a whole village (we could not work out where they came from). We felt guilty and handing over our half eaten sandwiches (probably the wrong thing to do?) we pressed on. Certainly no unscheduled toilet stops available in Malawi. Lilongwe was interesting, if only that the city is in 2 halves (a new and old town). The latter has much more character than the shiny austere new centre, which was alive with the start of another 4 day national holiday - Africa seems to be on one perpetual holiday throughout our visit! We heard that famine would hit Malawi too, with potentially more severe effects as the population is much greater within a smaller country. The south of the country is reported to be suffering the effects of the drought, something we cannot report upon as we did not venture further south than Liliongwe. The villages through which we passed seemed to have some foodstuffs available for sale on market stalls. There were large numbers of tomatoes and other vegetables, and aid sacks, but we were not sure if the locals had the money to buy these products. Interestingly bycicle manufacturers must have been having a field day in Malawi - there appeared to be more cycles that in China! More that that, the enormously heavy and unwieldly loads carried upon these two wheels by the locals was staggering! These objects presented some difficulties on the roads, as the individuals were often compelled to swerve unexpectedly due to the weight. 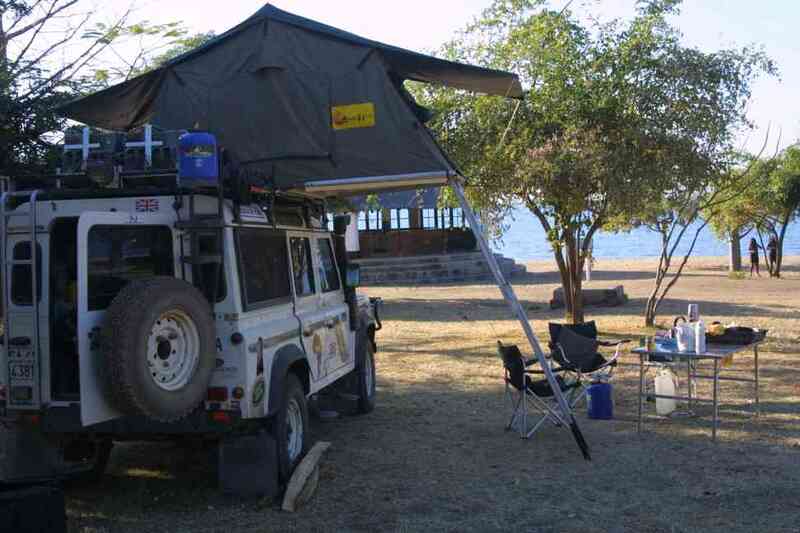 We drove onto Senga bay and stayed at Steps Campsite, adjacent to the old Livingstone Beach Hotel, now part of the Le Meridian group. Life on the lake is almost akin to being on a Spainish or Greek island, except there you do not get signs saying "Take care after dark, beware hippos". True or not (we saw nor heard none), one cannot be too careful! 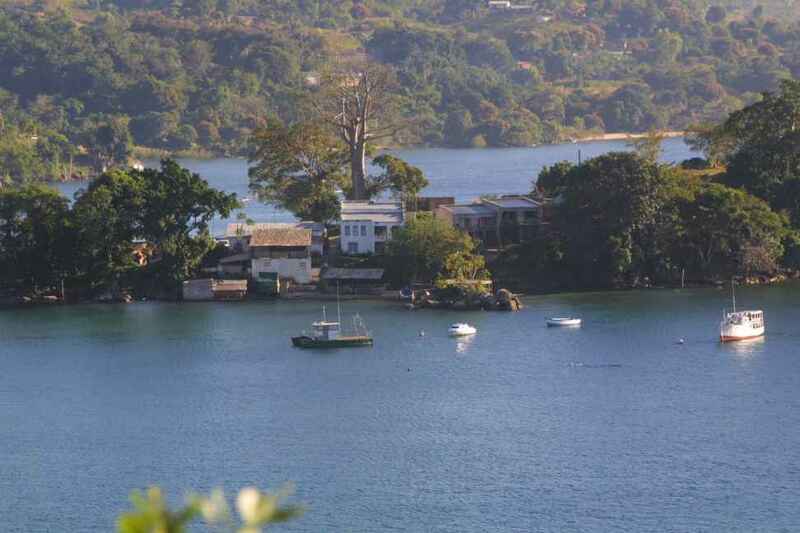 We had a leisurely start and drove along the lakeside road to Nkhata Bay- supposedly a resort with a mediterranean feel. We had been recommended Chikali Beach Resort, so we stopped there for the night. 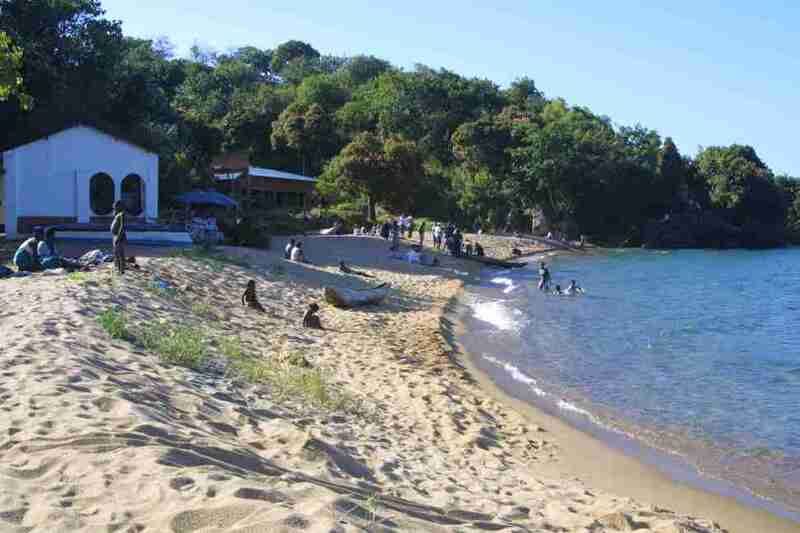 Unfortunately, due to the Malawi Independence celebrations, the beach was very busy, and the locals were using the resort as a thoroughfare. The owner opened up a chalet for us to use bathroom facilities, but even so it was rather like camping in a car park. We were constantly bothered by boys trying to sell us their collections of batiks, postcards and wooden carvings etc, and they were so persistent that in the end we said it was not our policy to buy anything on a Sunday, and they would have to come back on Tuesday, after the holiday (and after our departure). This eventually worked. We left early the next morning and travelled through some attractive hilly terrain, some of which appeared to be rubber plantation. There were childern trying to sell us what appeared to be rubber balls, made from giant strings of ruber. We reached Mzuzu, which had a distinctly colonial feel, and reminded us of an Asian hill plantation. It was a thriving community, even during a holiday period, and we were able to stock up on food, change money and buy fuel. David Livingstone's death in 1873 rekindled British missionary zeal within central Africa. Part of this revised initiative was a group of Free Church of Scotland missionaries intent on establishing a mission in Malawi. Their initial location was on the lake shore near Cape Maclear in 1875 and was named Livingstonia in honour of Dr Livingstone himself. Malaria had a terrible effect on these new missionaries, so they moved to a new site north along the shoreline to Bandawe, but the same plight was renered upon them. In 1894, Dr Laws again moved the mission onto the escarpment below the Nyika Plateau and the lake. 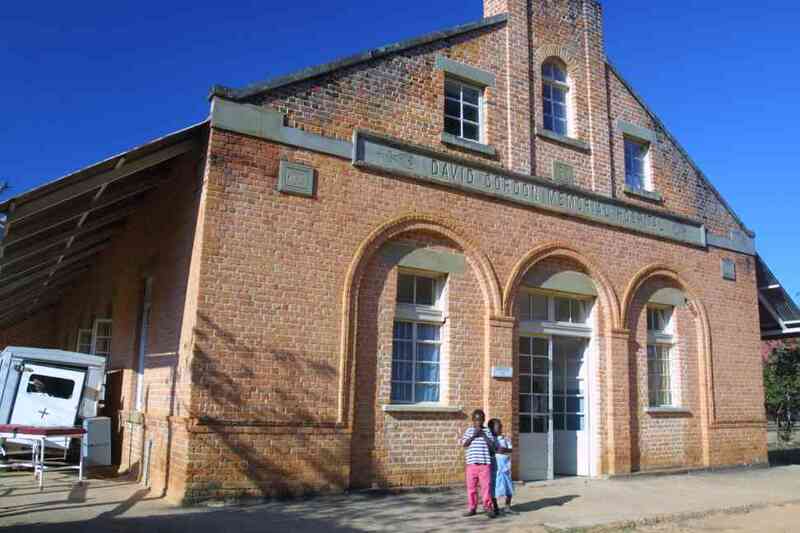 So was created a little piece of Scotland, with its church, what is thought to be the first Stone House in Africa, a post office, schools and the David Gordon Memorial hospital, all of which survives today in some guise or other. 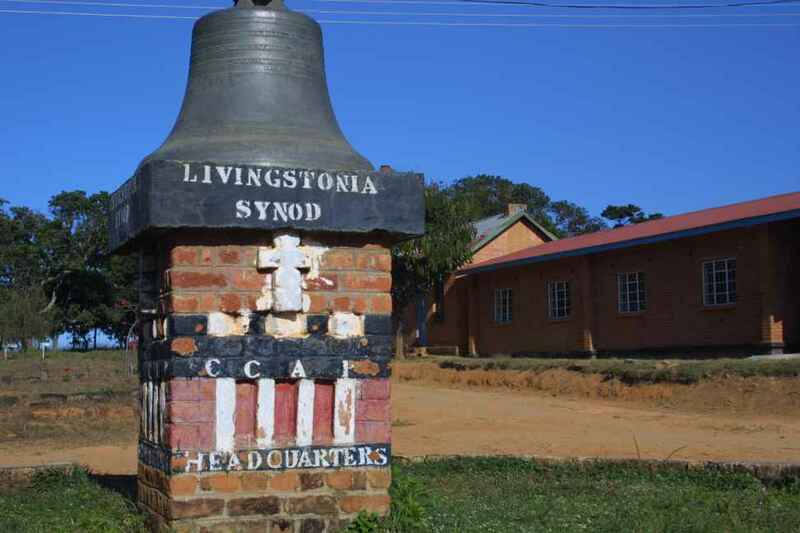 To reach the mission of Livingstonia, one has to negotiate 15km up a rough track of 20 hairpin bends. We did not have a problem with Daph, but we found a campervan halfway up taking a break to let the engine cool. When we arrived, we were very disappointed by what we found. The 'Stone House', a listed building as it is reported to be the first building made of stone in Africa, built for Dr Laws, had been left to decay. 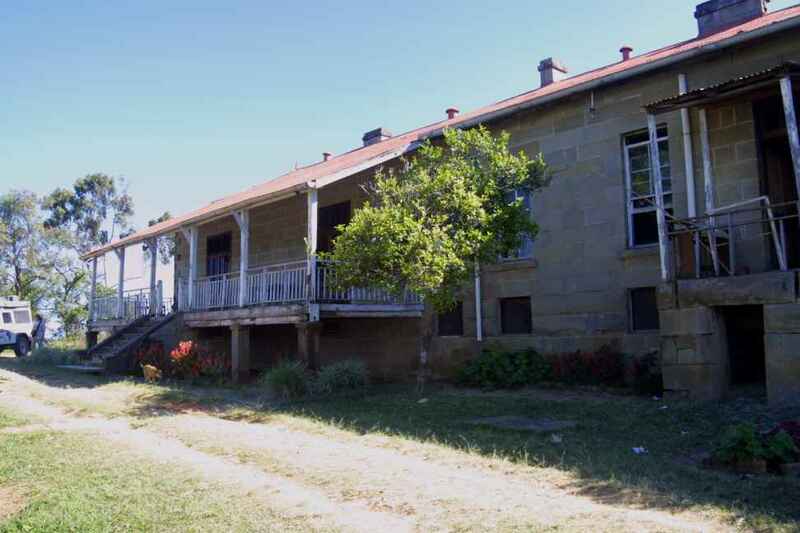 This was a great shame, as not only was it suppposed to be a guest house, but it housed the museum with some treasures, letters from Livingstone and other memorabilia. The Malawi Government had apparently decreed that the Stone House should be refurbished as a National Monument, but did not have the money to pay for this. So Rotary UK have stepped in with some volunteers from Devon, UK. 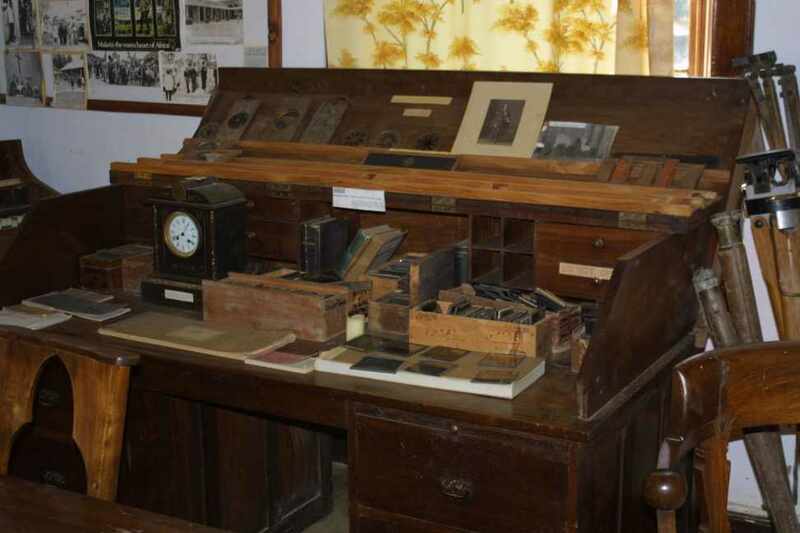 They had at first been told that they were to provide a lick of paint and carry out mainly surface repairs, but on examination they had found that there were considerable structural problems, and so were first having to carry out extensive repairs. When we reached the site we were told that the museum was closed, as the custodian had recently died (at 20 from AIDs), but following discussion with the charity workers we were allowed in to have a look. They told us that the exhibits would be sent back to the UK, to Strathclyde in Scotland. The David Gordon Memorial Hospital had been built along the lines of the old isolation institutions of Victorian England, and was very like Lodge Moor, in Sheffield. The buildings were in decay, though the wards were overflowing and there were people sitting all over the grass. We heard that many of the male population were working in the South African mines, and consequently they and their relatives in Livingstonia were dying from AIDS at the rate of 2 per week. 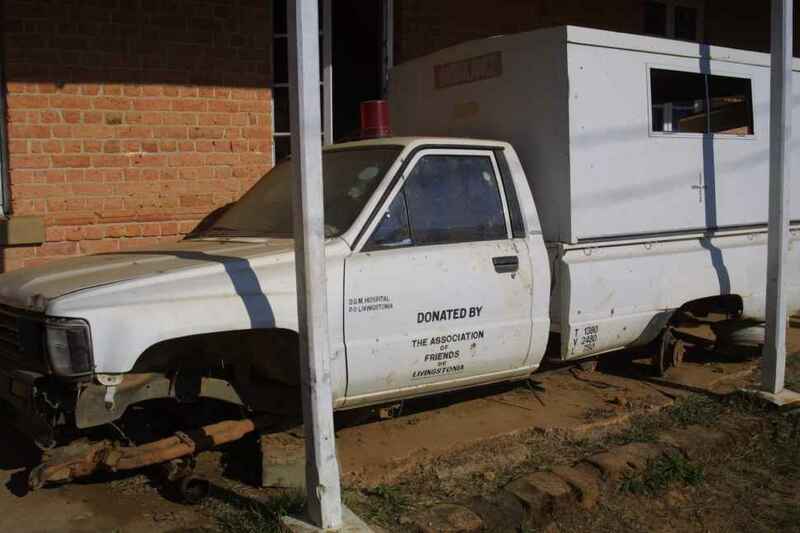 We also noted that quite a modern ambulance donated by the Friends of Livingstonia was left, wheel-less and crammed full of trolleys and other hospital equipment, by the side of the hospital. It was a shame, when this vehicle could have made people's lives easier, but it seemed sad to us that very often in Africa things were not maintained, but left to decay - usually where they stood. Somewhat deflated by our visit to Livingstonia, we camped that night near some falls on the edge of the escarpment. The site was well maintained, with hot showers and composting toilets. The next day we headed for the border, having first braved the hairpin bends and sheer drops down the escarpment. We again used our 'Illustrated Road Atlas of Africa' together with the Lonely Planet guide. These were sufficient, as finding ones way around was sufficiently stright forward and well sign-posted. Although we were in Malawi only briefly, our impression was one of contradiction. There is a huge freshwater lake (food and water), energy (sun and rivers) and numerous flowing rivers (irrigation). Yet we were told there is a famine. True - there is a very large population relative to the size of the country, but there is little organised farming - most people seem to exist via subsistence farming. This is in contrast to our observations in Zambia and Tanzania, where there are more organised means of farming and distributing products to market. 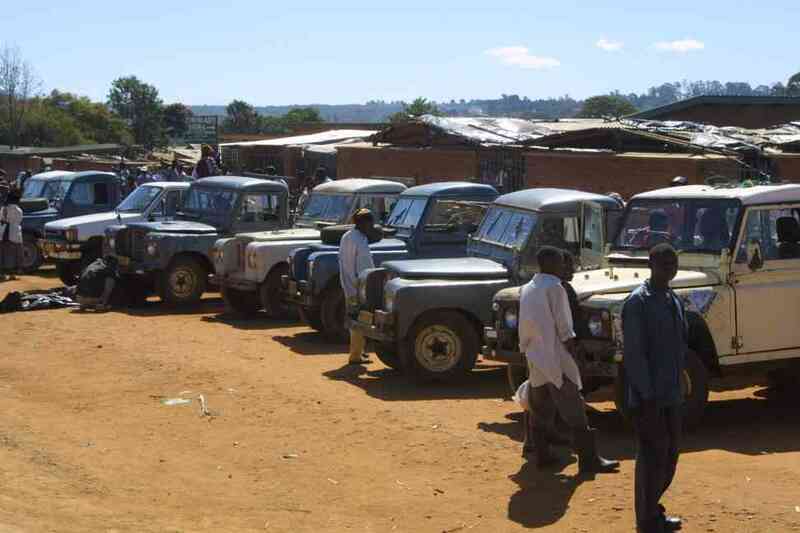 The roads in Malawi are excellent, so this would aid distribution of products. And so much for the 'smile of Africa' and broad welcome that is much advertised within guides and brochures. Whilst no one was rude or threatening, the constant haggling and pestering was quite unexpected. We understand it is only likely to get worse the further north we go!